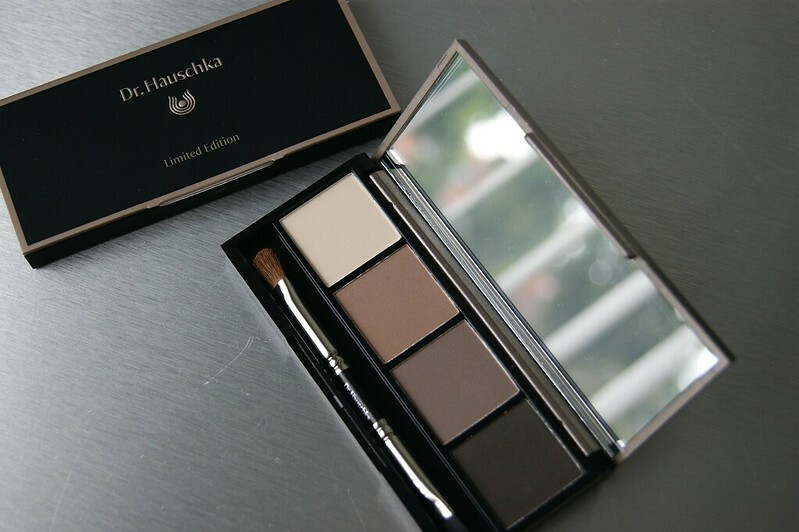 "Four matte shades of brown and grey enhance the natural beauty of your eyes, allowing for a combination of elegant looks that take eyes from day to night, Silk powder offers pH balancing and protective qualities." 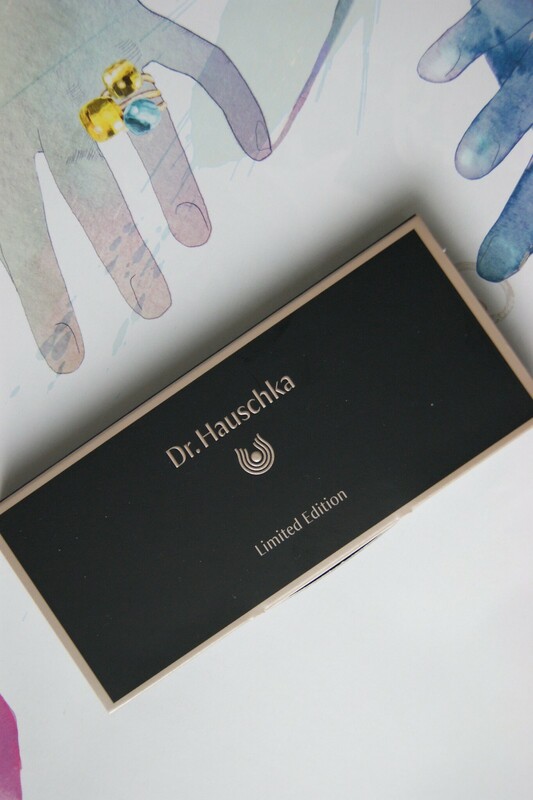 Dr. Hauschka has always been a 'familiar yet still unfamiliar' brand for me. I've heard about it from time to time when I was undergoing treatment for my skin, since it's known to be a great brand for sensitive skin, but I never got around testing it. Which is probably also why I didn't know they have cosmetics at well. 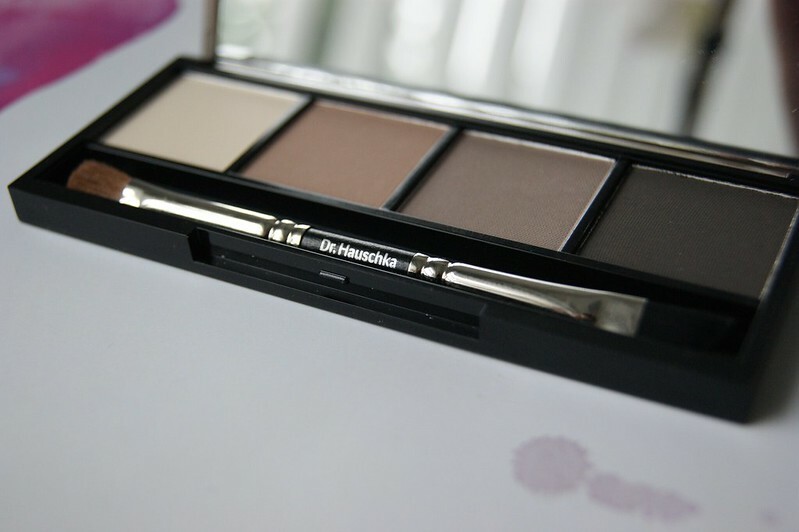 When I received some goodies to try, I was more than happy to find out more about the Dr. Hauschka Eyeshadow Palette 01. My eyes are super sensitive and I wear contacts, so it was time to put Dr. Hauschka's philosophy to the test. 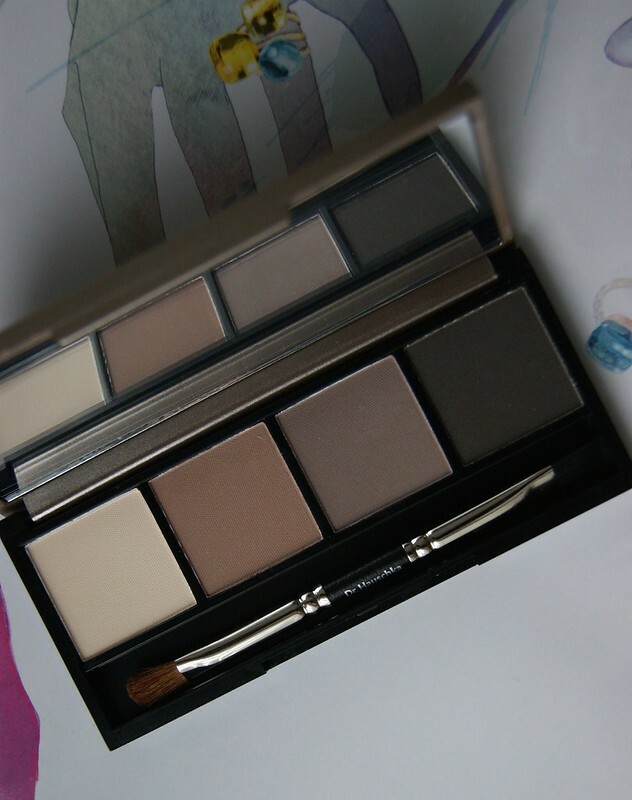 The actual palette comes in carton packaging, which folds open. 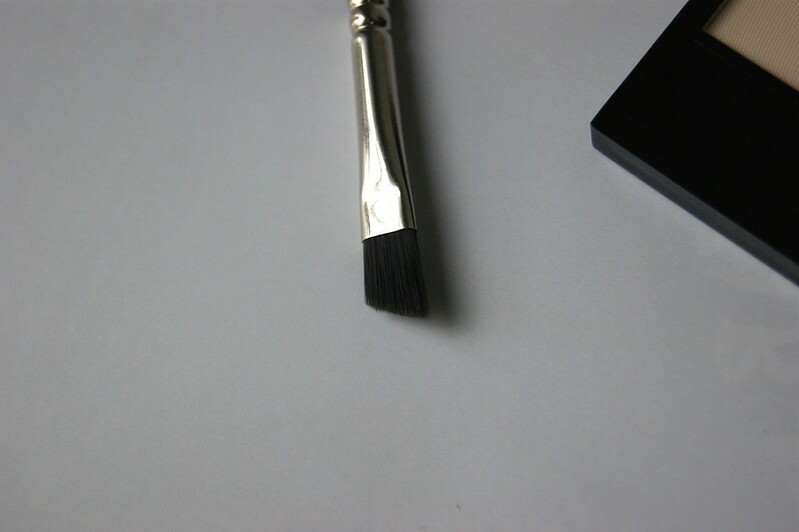 Inside, you can find information on the brushes that are included and on how to do your brows with the palette. Eyeshadow and eyebrow shadow in one. Score! On the back side of the carton packaging is a list with the ingredients. 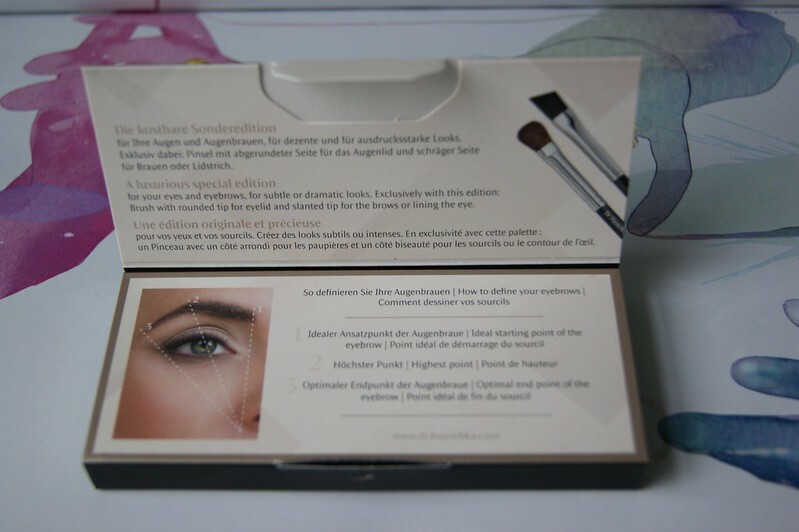 The eyeshadows come in a rectangular, taupe colored box. The packaging also has teeny tiny glitters, but they were quite hard to capture on photo. Inside is a big, rectangular mirror, four eyeshadows and a two-headed brush. 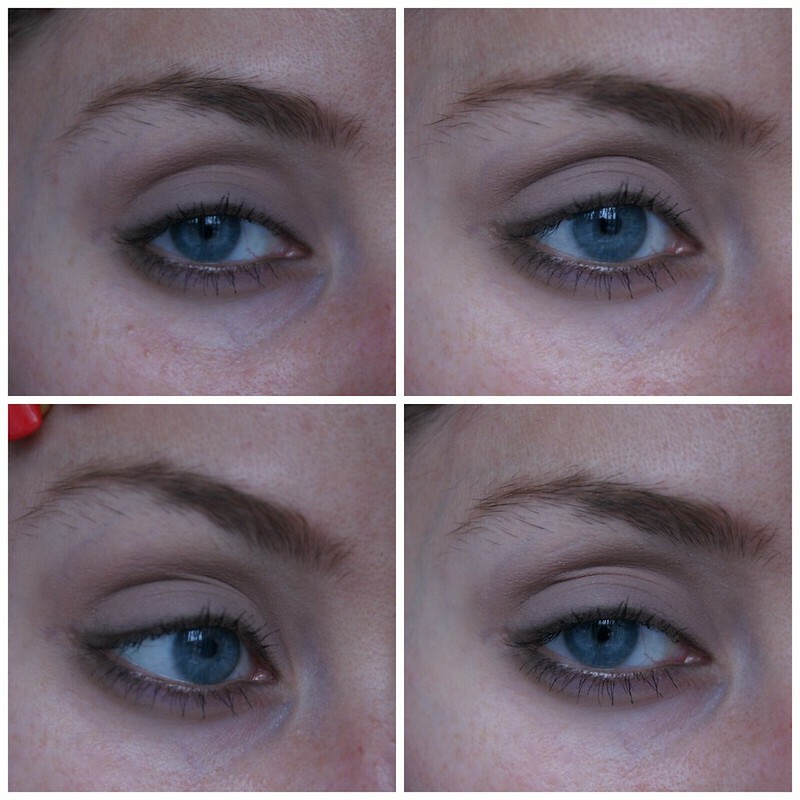 The brush can be used for doing both your eyelids (first picture) and eyebrows (second picture). 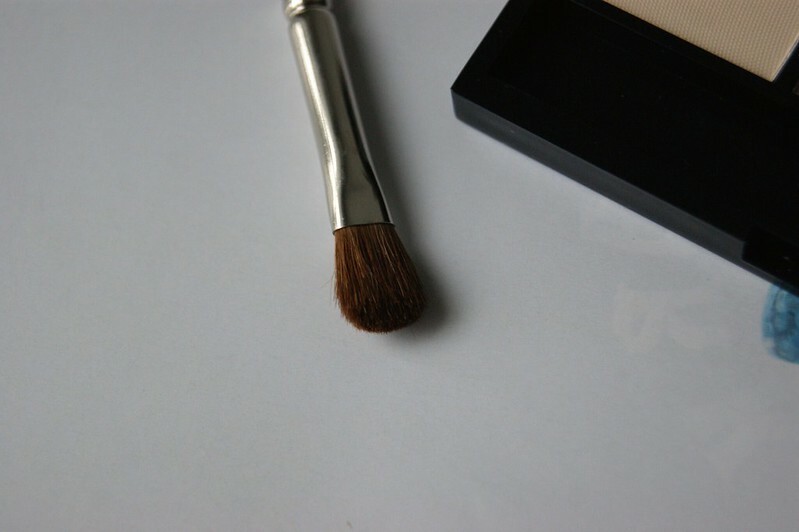 I usually prefer my own brushes instead of the included one, but this is a great option to take with you when you're on the go or on a holiday and you have limited space in your bag or suitcase. They are the perfect shades to create either an intense, dark evening look or a basic, subtle look to wear to the office, for example. 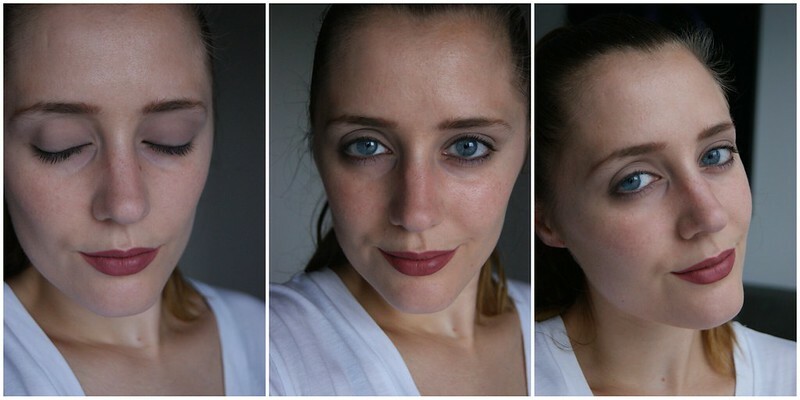 I love how versatile this palette is, even if it 'only' contains four basic colors. The only thing that bothers me is the scent of the eyeshadows -- you know my issues with scents, lol. They have a flowery / soapy smell, but luckily you don't smell it anymore once you apply the eyeshadows to your eyes. 1. I started with primer on my eyelids and underneath my eyebrows. 2. I then applied Sand underneath my eyebrows. 3. Then, I applied Light Brown on my eyelids and faded it upwards. 4. Afterwards, I applied Soft Grey on my eyelids and blended it with Light Brown a bit. 5. I used Anthracite right above my eyelashes and on my lower lash line to intensify the look and added some mascara as well. 6. I also used Light Brown on my brows. And that's about it! 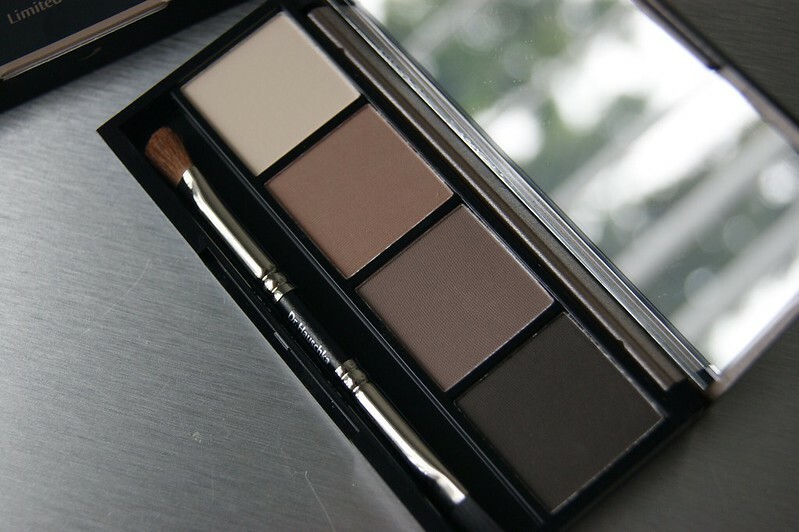 This palette is super easy to use if you're just starting with eye make up and it's the perfect alternative if you don't use a lot or heavy make up. I don't wear eye make up often because I wear contacts and my eyes are very sensitive. 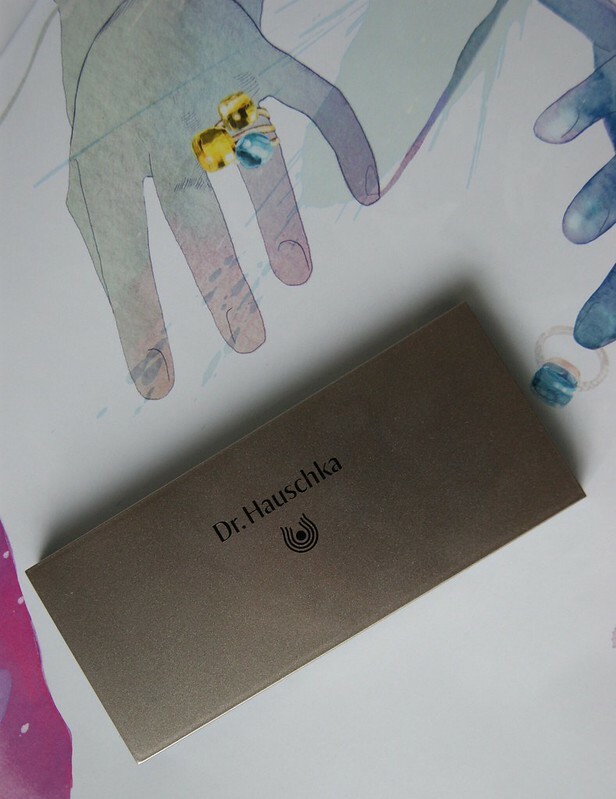 But since Dr. Hauschka is known to be a great brand for sensitive skin, I decided to put it to the test. I wore the look above for a date night to the movies with the boyfriend and my eyes didn't get irritated once. That's a first for me. My eyes usually get a itchy / burning feeling when I wear make up or they get all red and irritated. I'll definitely be using this palette on a regular basis. 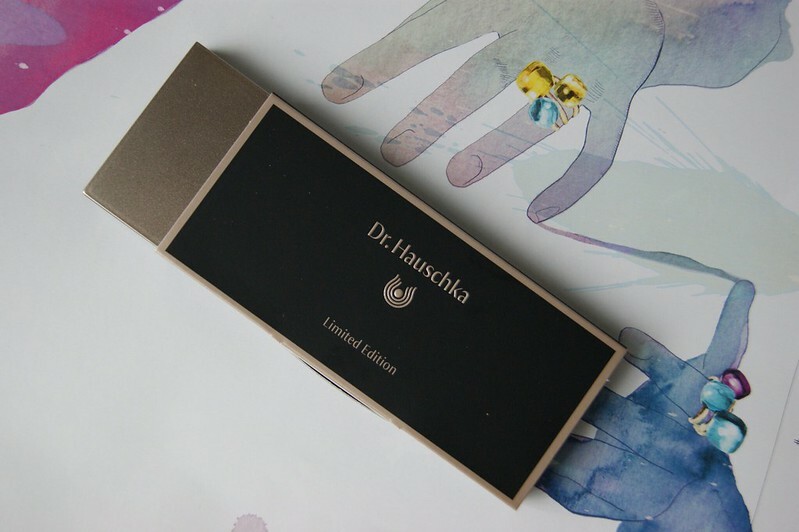 The Dr. Hauschka Eyeshadow Palette 01 is limited edition and sells for € 28,85. Girl pluck your eyebrows, this isn't highschool. thank you for taking the time to comment, even if it is an anonymous hate comment. How cliché. I'd also like to thank you for adding to my blog's stats, as I always like to see the positive things instead of the negative ones. As for my brows: I'm sorry they bother you so much. Since it really seems like a first class problem to you, I'm happy to inform you that I have a brow appointment this Friday. However, the palette in the blogpost above is limited edition, so the post couldn't wait until then. Also, enlighten me on the 'high school part', since I don't really understand the eyebrows and high school link. The only thing that seems high school to me is you sitting behind your computer and writing hate comments anonymously. I love this make up look! Great post! Oh supermooie kleuren in het palette! 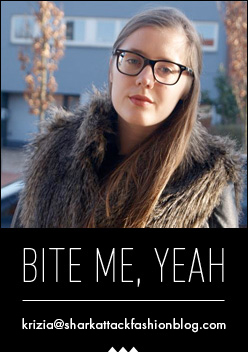 I just discovered your blog - and love it. Aww, thank you! That's so sweet! Thank you! That's too sweet.